I’m sure this has happened to you. You’re walking through a parking lot, or sitting on a restaurant patio, or chilling in a hotel room – and all of a sudden, a car alarm starts going off. Not “Someone’s being robbed!” or “A car is being stolen!” but sheer and utter annoyance. I’m sure we’ve all observed (but certainly never done ourselves) someone accidentally hit the alarm button on their car remote (aka fob). While the obnoxious alarm cries wolf and echoes off walls, windows, and other cars, the mortified auto owner fumbles around with the remote, pressing every button they can get their fingers on, trying to get the thing to just shut off already. Add together those two situations, and subtract the number of times you’ve actually seen a car alarm going off because the car was being stolen (most likely zero, unless you live in North Denver), and you have the amount of times no one will panic when a car alarm goes off. I recently observed a similar thing. I was at the grocery store on Tuesday night, buying ingredients to make Chicken Pesto Pasta and Peanut Butter Rice Krispie Bars. As I walked through the frozen vegetable aisle on my way to the dairy case, the fire alarm went off. The white lights were flashing, the sirens blaring. I stopped walking and looked around, unsure if it was for real or not. As I did so, I looked at my fellow shoppers. They all kept shopping as if it there was not a 115 decibel sound ringing in their eardrums. The people in line at the pharmacy just stood there, waiting. Seriously? We are now desensitized even to a fire alarm? I have to admit, once I saw no one reacted to the fire alarm, I also continued shopping. Meh, if the flames aren’t anywhere near me now, I definitely still have time to escape if the fire is real. These two situations are prime examples of when technologies that are supposed to be helpful end up failing miserably. The thing about technologies is that they’re still being used for and by humans. Until we’re out of the picture, we just have to admit that they’re not going to function like they were intended to. We are continually messing things up, finding ways around them. 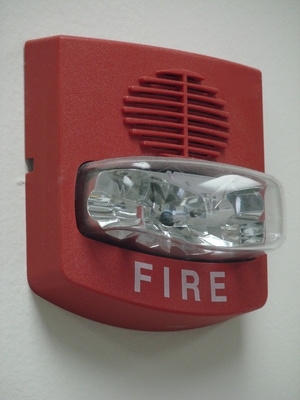 It’s too much work to panic every time a car or fire alarm goes off. So we just stop panicking altogether. Although, I had this thought as I stood in line at the Express Lane 15-item Self-Checkout behind a guy who obviously had something more like 40 items, the fire alarm still blaring away: if the sprinklers went off in addition to the alarm, there would be a greater likelihood of people clearing out. But I’m sure there would still be that old stubborn lady, bound and determined to buy her prune juice, who would refuse to leave until the flames were licking at her feet. Dear Lord, save us from ourselves. I used to work at our city’s largest shopping mall, they would get so many false fire alarms daily that the regular shoppers and employees pretty much didn’t care anymore no matter how many alarms would go off. Even the real fire alarms a lot of people don’t take seriously, for that price reason that you stated. The sprinkler never went off so why are they worried right? never fails 🙂 lol thank you for sharing! Funny how we have become so desensitized to alarms like that – and really do just get annoyed. Guess those fire drills have turned us to the boy who cried wolf syndrome. Not good. But still, funny story.